Fans of indie folk, prepare for one of the best performances you’ll ever see. 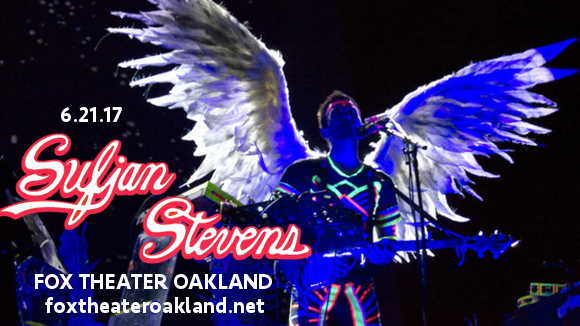 The wonderful Sufjan Stevens is on tour, coming to the Fox Theater Oakland on Firday 21st July 2017! Tickets selling fast – don’t delay in getting yours! Hit the “Buy Tickets,” button now to be sure of your place. A songwriter known for his diversity of genres and use of unusual time signatures and instrumentation, Sufjan Stevens is probably best known for his concept album “Illinois,” in 2005 and it’s single “Chicago.” The album was lauded by critics for its thoughtful lyrics, centered around the culture and history of the state, and beautifully instrumented, thoroughly unique musical content. One of the most versatile songwriters in modern music, Sufjan Stevens moves easily from one genre to another, his fanbase remaining true regardless, such is the appeal of Stevens’ flawless songwriting. From the electronic sounds of “Enjoy Your Rabbit,” to the huge orchestral sound of “Illinois,” his songs remain heartfelt, evoking our deepest feels of joy and sadness regardless of instrumentation. Don’t miss out on your chance to see Sufjan Steven’s sublime performance live – book your tickets today while they last! !